Figure 1: Photograph of ~1000 m of continuous subaerial flood basalt stratigraphy at the top of the Nikolai Formation in the Wrangell Mountains, Alaska. Wrangellia flood basalts in the Pacific Northwest of North America are perhaps the most extensive accreted remnants of an oceanic plateau in the world where parts of the entire volcanic stratigraphy are exposed. Wrangellia flood basalts formed as an oceanic variety of a large igneous province (LIP) in the Middle to Late Triassic, with accretion to western North America occurring in the Late Jurassic or Early Cretaceous (e.g. Richards et al., 1991). Current exposures of the flood basalts are preserved in a narrow belt over 2300 km in length extending from southern British Columbia (BC) through Yukon and into Alaska (Fig. 2). The present distribution of accreted sections of the Wrangellia plateau is primarily a result of transform fault motions that occurred along western North America after accretion; the total area of the plateau prior to accretion was likely considerably larger. An ongoing research project is examining the stratigraphic and geochemical architecture of the erupted lava sequences of the Wrangellia oceanic plateau (Greene et al., 2008a; 2008b; 2008c; 2008d). Approximately ten oceanic plateaus that have formed in the last 130 Myr range in size from 100,000 to 2 million km2 and cover a total area of about 10 million km2 (~3%) of the ocean basins, mostly in the Pacific and Indian Oceans (an area equivalent to Europe or the United States; e.g. Eldholm & Coffin, 2000). Studying oceanic plateaus in the ocean basins is very difficult because of the technological challenges of drilling into more than the uppermost few hundred meters of the submerged flood basalt sequences, which can be six or more kilometers thick (e.g. Kerguelen, Ontong Java, etc.). The volcanic stratigraphy of oceanic plateaus can also be studied on land where the deeper levels of accreted volcanic stratigraphy can be sampled [e.g. Caribbean (Kerr, 2003), Ontong Java (Mahoney et al., 1993; Tejada et al., 1996)]. These studies can provide constraints on the compositional evolution of mantle plume melting events that occur beneath the oceans in a similar way that continental flood basalts (CFBs) have been used to understand the sequential development of mantle plumes and rifting beneath continental lithosphere (e.g. Peate, 1997; Storey et al., 1997). This information, in turn, provides insights on the less accessible parts of oceanic plateaus in the ocean basins, such as the Ontong Java and Kerguelen Plateaus. The Wrangellia oceanic plateau formed mostly within the Late Ladinian and Carnian stages of the Triassic Period (ca. 231-225 Ma; e.g. Carlisle & Suzuki, 1974; Parrish & McNicoll, 1992), as the continents were gathered into a great landmass. The Wrangellia flood basalts erupted onto different-aged Paleozoic arc volcanic and marine sedimentary sequences in both shallow and deep marine settings. Paleontological and paleomagnetic studies indicate that the Wrangellia flood basalts probably erupted in the eastern Panthalassic Ocean in equatorial latitudes (Jones et al., 1977; Katvala & Henderson, 2002). Paleomagnetic measurements of the flood basalts have not yet revealed any magnetic reversals and, together with the absence of intervening sediments between the flows, this suggests a short duration for the eruptions (Hillhouse, 1977; Yole & Irving, 1980; Hillhouse & Coe, 1994). The eruption of Wrangellia flood basalts broadly coincides with major biotic and environmental changes worldwide that occurred at the end of Carnian time (Furin et al., 2006). The accretion of the Wrangellia oceanic plateau to western North America was a major tectonic event and represents a significant addition of oceanic mantle-derived material to western North America (Condie, 2001). Much of the original stratigraphic thickness of the Wrangellia plateau is intact and is defined as the Karmutsen Formation on Vancouver and Queen Charlotte Islands (Haida Gwaii), and as the Nikolai Formation in southwest Yukon and south-central Alaska (Figs. 2 and 3). On Vancouver Island, the volcanic stratigraphy is a tripartite succession of submarine, volcaniclastic, and subaerial flows approximately 6 km thick. In Alaska and Yukon, the volcanic stratigraphy (~3.5 km) is predominantly massive subaerial flows with a small proportion of submarine flows along the base. Smaller elements in southeast Alaska may be correlative with the Wrangellia flood basalts. Throughout areas of Wrangellia the flood basalt stratigraphy is bounded by Middle to Late Triassic marine sediments. The ongoing study of the Wrangellia oceanic plateau integrates stratigraphic, geochemical, and geochronological results to provide constraints on the nature of the mantle source, conditions of melting and magmatic history of the basalts, and the duration of volcanism in the context of the construction of this major oceanic plateau (Greene et al., 2008a; 2008b; 2008c; 2008d). Figure 2: Map showing the distribution of Wrangellia flood basalts in Alaska, Yukon, and British Columbia. The map is derived from (Wilson et al., 1998; Israel, 2004; Massey et al., 2005a, b; Wilson et al., 2005; Brew, 2007, written comm.). Outlines for the Peninsular and Alexander Terranes are shown in orange and blue, respectively. We refer to the Wrangellia Terrane in Alaska and Yukon as Northern Wrangellia and areas in British Columbia as Southern Wrangellia. Major faults in Alaska and parts of Yukon and BC are shown with purple lines. The Wrangellia, Alexander, Peninsular terranes, which are part of the Wrangellia Composite Terrane, share similar elements or have a linked geologic history [as defined by Plafker et al. (1989), Nokleberg et al. (1994), Plafker & Berg (1994), and Plafker et al. (1994)]. Geochronology from a single pluton in Alaska is proposed to link the Proterozoic to Triassic Alexander Terrane to Wrangellia by late Pennsylvanian time (Gardner et al., 1988). The Wrangellia and Peninsular Terranes may have been in close proximity by the Late Triassic or Early Jurassic (Rioux et al., 2007). Figure 3: Stratigraphy of accreted section of the Wrangellia oceanic plateau in Alaska, Yukon, and British Columbia (locations for areas of stratigraphic columns are shown in Figure 2). (a) Stratigraphic column of the Amphitheater Mountains, Alaska, derived from Nokelberg et al. (1985). (b) Stratigraphic column for the south side of the Wrangell Mountains, derived from Smith & MacKevett (1970) and MacKevett (1978). (c) Stratigraphic column of the Kluane Ranges, Yukon derived from Israel et al. (2006). (d) Stratigraphic column of northern and central Vancouver Island, derived from Nixon et al. (2006). Total estimated stratigraphic thicknesses for the Nikolai and Karmutsen Formations are outlined with boxes. In the 1970s, Jones and co-workers (1977) defined a terrane of fault-bound blocks of crust that contain diagnostic Triassic flood basalts in BC, Yukon, and Alaska as Wrangellia, named after the type section in the Wrangell Mountains of Alaska (Fig. 2). Early paleomagnetic and paleontological studies of Wrangellia indicated long-distance displacement of the basalts from low latitudes (Hillhouse, 1977) and similar Daonella bivalves were found in sediments directly beneath the flood basalts on Vancouver Island and in the Wrangell Mountains (Jones et al., 1977). A back-arc setting was initially proposed for the formation of Karmutsen basalts on Vancouver and Queen Charlotte Islands based on major- and trace-element geochemistry of 12 samples (Barker et al., 1989). Richards and co-workers (1991) proposed a plume initiation model for the Wrangellia flood basalts based on evidence of rapid uplift prior to volcanism, lack of evidence of rifting associated with volcanism (few dikes and abundant sills), and the short duration and high eruption rate of volcanism. A study of 36 samples of Wrangellia flood basalts, 29 samples from Buttle Lake on Vancouver Island and 9 samples from the Wrangell Mountains in Alaska, was undertaken by Lassiter and co-workers (1995) as part of one of the few integrated geochemical and isotopic (Sr-Nd-Pb) studies of Wrangellia flood basalts. Lassiter and co-workers (1995) suggested a plume-type source for Wrangellia basalts with a restricted amount of lithospheric involvement. Volcanic stratigraphy of the accreted Wrangellia oceanic plateau in Alaska and Yukon (Nikolai Formation) was initially emplaced in a shallow marine environment, but the majority of the volcanic stratigraphy formed as compound pahoehoe flow fields in a subaerial environment, in a similar way to subaerial flows in CFBs (Figs 1, 3, 4, and 5). In contrast, the Wrangellia flood basalts on Vancouver Island (Karmutsen Formation) grew from the ocean floor and accumulated >3000 m of pillowed and massive submarine flows before emplacement of 400-1500 m of hyaloclastite and pillow breccia as the plateau formed in shallow water and reached sea level (Figs 3 and 6). The lowest pillowed flows were emplaced on unconsolidated and lithified fine-grained siliciclastic and carbonaceous sediments containing Daonella beds (ca. 235-232 Ma) that are intruded by abundant Karmutsen mafic sills (Fig. 7). Minor volumes of picritic pillow lavas occur in the upper part of the pillowed flow sequence in areas of the plateau exposed on northern Vancouver Island (Fig. 6; Nixon et al., 2008). Approximately 1500 m of subaerial flows were emplaced on top of the submarine flows and intervolcanic sedimentary lenses in the upper parts of the subaerial stratigraphy formed in shallow water as eruptions waned and the plateau was subsiding. After volcanism ceased, for areas of accreted stratigraphy in Alaska, Yukon, and British Columbia, the plateau continued to subside for more than 25 Myr and was overlain by hundreds to >1000 m of limestone and siliciclastic deposits (Fig. 8). The duration of volcanism for Wrangellia flood basalts in Alaska, Yukon and British Columbia was probably less than 5 Myr and the age of eruption of the plateau is restricted to the interval from 231 to 225 Ma (Greene et al., 2008d). Figure 4: Photographs of the base of the Nikolai Formation in the Wrangell Mountains, Alaska. (a) Westward-dipping Paleozoic arc volcanic rocks of the Station Creek Formation overlain by Early Permian shale and limestone (Phc-Hasen Creek Formation; Pgh-Golden Horn Limestone Lentil), isolated lenses of Middle Triassic ‘Daonella-beds’ (TRd), basalt flow-conglomerate with local pillows, and massive subaerial flows on the north side of Skolai Creek. Photograph by Ed MacKevett, Jr. (b) Close-up photograph of area b in photograph a. (c) Close-up photograph of area c in photograph b showing basal flow-conglomerate with clasts of rounded cobbles of white limestone (<20 cm) derived from Golden Horn Limestone Lentil and red basalt (<40 cm) from Station Creek Formation. Pen (14 cm) in middle of photograph for scale. 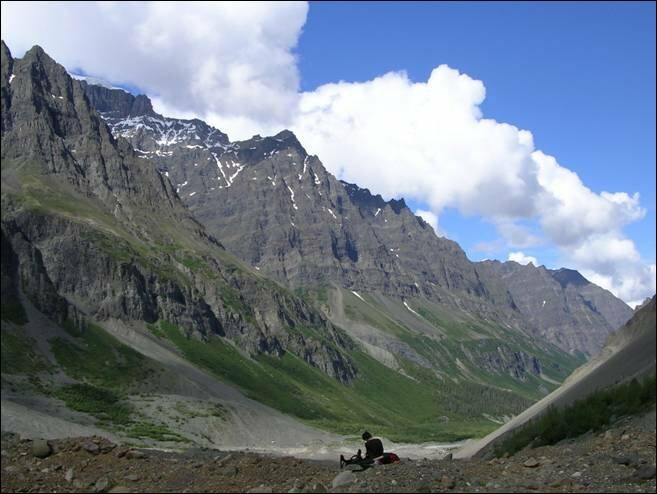 Figure 5: Photograph of the top of the Nikolai Formation and overlying Chitistone Limestone on the north side of Hidden Lake Creek in Wrangell-St. Elias National Park. Several faults offset the contact. Along the contact there is rare evidence of erosion or sedimentation. Thinly-bedded siltstone and small zones of subangular oxidized basalt cobbles occur along the contact. 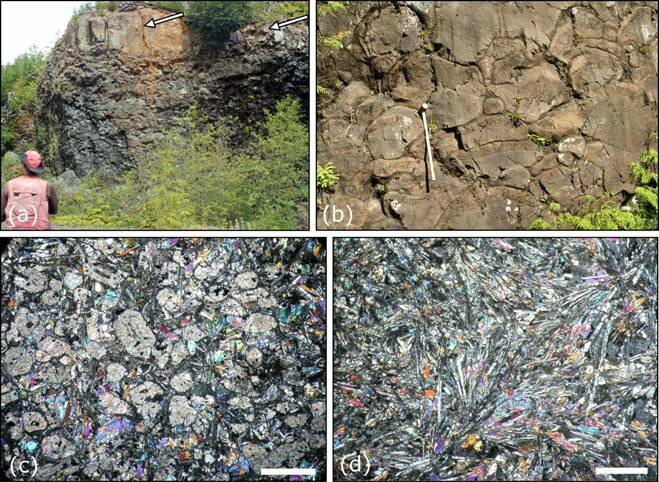 Figure 6: Field photographs and photomicrographs of picritic and high-MgO basalt lavas in the Karmutsen Range, northern Vancouver Island. (a) Massive submarine flow (marked with arrows) draped over high-MgO pillow basalt of similar composition. (b) Picritic pillow basalts in cross-section. Note vesicular upper margin to pillows (sledgehammer for scale). (c) Photomicrograph of Keogh Lake picrite with abundant (up to 42 vol %) euhedral olivine pseudomorphs (<2 mm) in XPL, from the type locality near Keogh Lake (sample has 19-19.8 wt % MgO, 4 analyses). The groundmass is acicular plagioclase intergrown with clinopyroxene and altered glass. In many cases, plagioclase in the picrites nucleated on the edges of the olivine phenocrysts. (d) Sheaves of intergrown plagioclase and clinopyroxene in aphyric high-MgO basalt pillow lava in XPL from the Karmutsen Range (sample has 10.8 wt % MgO). The scale bars in panels c and d are 1 mm long. See discussion of picrites in Greene et al. (2006; 2008c). Figure 7: Photograph of limestone of the upper Paleozoic Buttle Lake Group (gray) intruded by mafic sills and overlain by pillow basalt of the Karmutsen Formation (black) at the base of the accreted Wrangellia oceanic plateau on the west side of Buttle Lake in Strathcona Provincial Park, central Vancouver Island. Figure 8: Diagrams of the construction of the Wrangellia oceanic plateau. From top to bottom, the diagrams depict the eruption environment and growth of the volcanic stratigraphy for areas of Wrangellia flood basalts on Vancouver Island and in Alaska and Yukon. Pre- and post-volcanic sedimentary sequences and underlying Paleozoic arc units are also shown. Most of the units in the sketches are labeled so there is no accompanying legend. Volcanic activity in each of the areas initiated with submarine flows emplaced on pelagic sediments and all of the flood basalts are overlain by Late Triassic limestone. The geochemistry of volcanic stratigraphy of the Karmutsen Formation on Vancouver Island is largely light rare earth element (LREE)-enriched tholeiitic basalt with a restricted major- and trace-element, and isotopic composition (Figs 9, 10, and 11). High-Mg picritic pillow lavas that occur within the volcanic stratigraphy on northern Vancouver Island are depleted in LREE and have similar initial isotopic compositions to the tholeiitic basalts. However, there does not appear to have been a systematic evolution or shift of lava compositions within the volcanic stratigraphy on Vancouver Island. The isotopic compositions of the tholeiitic basalts and picrites indicate a plume-type Pacific mantle source, less depleted than the source of mid-ocean ridge basalts (MORB), and comparable to the source that produced basalts of the Caribbean oceanic plateau. Modeling of melting conditions for the picrites, utilizing the technique of Herzberg et al. (2007), indicate that the primary magmas for the picrites of the Karmutsen Formation originated from high degrees of partial melting (25-30%) of unusually hot mantle (~1450ºC); this is consistent with formation during the start-up phase of a mantle plume. Decompression melting within the mantle plume initiated within the garnet stability field (>2.7 GPa; 80 km) and proceeded beneath oceanic lithosphere where more extensive degrees of melting occurred within the spinel stability field (<60 km). The picrites lack a residual garnet signature; melts that erupted as picrites formed at shallower depth than the tholeiitic basalts without involvement of garnet. The major-element compositions of Karmutsen tholeiitic basalts (low Mg#, MgO, etc.) indicate an important role for fractional crystallization of melts at low pressure and crustal velocities in seismic refraction lines indicate that some of the crystalline residues from partially crystallized Karmutsen magmas may be present beneath Vancouver Island (Clowes, et al., 1995). The geochemistry of picritic and tholeiitic basalts on Vancouver Island offers a view of the melting history of plume-derived magmas that does not involve continental lithosphere and where source heterogeneity does not have a major role. 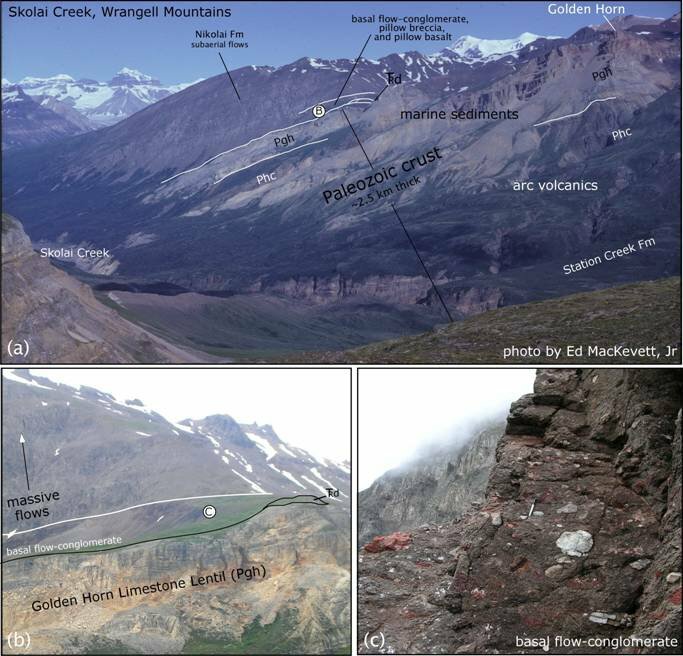 In Alaska and Yukon, Wrangellia flood basalts of the Nikolai Formation are composed of high- and low-titanium basalts that record a change in the source of magmas that formed this part of the Wrangellia oceanic plateau (Figs 9, 10, and 11). The low-titanium basalts form the lowest ~400 m of volcanic stratigraphy in the Alaska Range in Alaska and lower parts of stratigraphy in the Kluane Ranges in southwest Yukon, and the remainder of the volcanic stratigraphy in Alaska and Yukon is high-titanium basalt. The high-titanium basalts were derived from a relatively uniform plume-type Pacific mantle source, compositionally similar to the Ontong Java Plateau. The low-titanium basalts involved a HFSE-depleted, high εHf component that is distinct from ocean island basalts (OIB) and MORB and was only involved during the early phase of this major melting event (Figs 10 and 11). The low-titanium basalts have compositions that indicate melting and/or interaction with subduction-modified lithospheric mantle was involved in their formation (Fig. 12). HFSE-depletions in the Paleozoic sub-arc lithospheric mantle generated high 176Hf/177Hf with respect to 143Nd/144Nd; a mantle plume initiated melting in the sub-arc lithospheric mantle due to conduction of heat and possibly a lower liquidus temperature from volatiles in the Paleozoic sub-arc lithospheric mantle. The lithosphere may have been mechanically or thermally eroded, whereafter melting occurred mostly within the plume to produce the voluminous high-titanium basalts (Fig. 12). 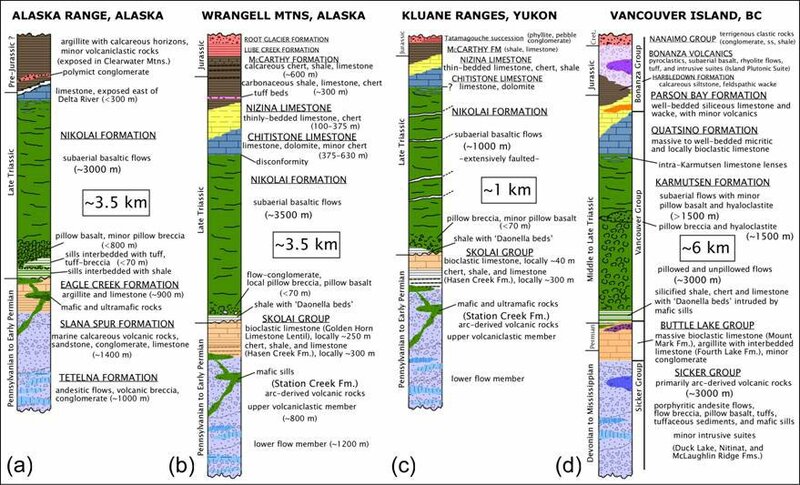 Figure 9: Whole-rock major-element variation diagrams for Wrangellia flood basalts of the Karmutsen and Nikolai Formations in British Columbia, Yukon, and Alaska. (a) Na2O+K2O vs. SiO2. (b) TiO2 vs. MgO. The boundary of the alkaline and tholeiitic fields in panel a is that of MacDonald and Katsura (1964). Note the Yukon samples have undergone strong alteration and Na-K addition; they were not originally alkalic basalts. Analyses by Activation Laboratory for Vancouver Island and Yukon samples, and the University of Massachusetts X-Ray Fluorescence Laboratory for Alaska samples. Figure 10: Whole-rock primitive mantle-normalized trace-element patterns for the Wrangellia flood basalts of the Karmutsen and Nikolai Formations in British Columbia, Yukon, and Alaska. Note the different range for the vertical scale in panels a and b (panel a extends down to 0.1) and no Pb values in panel a. In panel a, note the clear distinction between LREE-enriched tholeiitic basalts and LREE-depleted picrites on Vancouver Island. In panel b, note the clear distinction between LREE-enriched high-titanium basalts and LREE- and HFSE-depleted low-titanium basalts from Alaska and Yukon. Despite alteration, samples have retained most of their original chemistry (except for LILE). Analyses by Activation Laboratory for Vancouver Island and Yukon samples, and the Pacific Centre for Isotopic and Geochemical Research (PCIGR) for Alaska samples. Normalization values are from McDonough and Sun (1995). Figure 11: Comparison of age-corrected (230 Ma) Sr-Nd-Hf isotopic compositions of Wrangellia flood basalts in British Columbia, Alaska, and Yukon to other oceanic plateaus and MORB. (a) Initial εNd vs. 87Sr/86Sr. (b) Initial εHf vs. εNd. Note the high εHf for the low-titanium basalts in panel b that are displaced well above the OIB mantle array. OIB array line in panel b from Vervoort (1999). EPR is East Pacific Rise. Estimation of fields for age-corrected Pacific MORB and EPR at 230 Ma in panels a and b were made using parent-daughter concentrations (in ppm) from Salters and Stracke (2004) of Lu=0.063, Hf=0.202, Sm=0.27, Nd=0.71, Rb=0.086, and Sr=8.36. See Greene et al. (2008b) for references for MORB and other oceanic plateau data sources. Analyses for all Wrangellia samples were performed at the Pacific Centre for Isotopic and Geochemical Research (PCIGR) at the University of British Columbia following techniques outlined in Weis et al. (2006, 2007). Figure 12: Schematic diagrams of two stages of melting that produced the low- and high-titanium basalts of the Nikolai Formation in Yukon and Alaska. Parts of the diagrams were adapted from a drawing by J. Holden in Fodor (1987) and Farnetani & Samuel (2005). (a) Low-titanium basalts form the lower parts of the stratigraphy in parts of Yukon and Alaska. In this scenario, a plume head impinging on the base of arc lithosphere leads to the formation of small-degree, HFSE-depleted low-titanium basalts from a source in subduction-modified lithospheric mantle. (b) High-titanium basalts, which dominate the remainder of the volcanic stratigraphy, were derived from a plume-type source. White arrows indicate flattening of the plume head. Black arrows indicate heat conduction from the plume into the base of the lithosphere. The dashed line represents the base of the mechanical boundary layer. Vertical exaggeration = ~10:1. The accreted Wrangellia oceanic plateau is an exceptional natural laboratory on land to study and sample the volcanic stratigraphy of an oceanic plateau. These exposures hold answers to some of the important questions about the development of oceanic plateaus that remain mostly hidden beneath the surface of the ocean. Wrangellia flood basalts formed in submarine and subaerial environments in the Middle to Late Triassic during a single, short-lived eruptive phase lasting <5 Myr. In Alaska and Yukon, low-titanium basalts form lower parts of the volcanic stratigraphy, and the remainder of the volcanic stratigraphy is high-titanium basalt. The low-titanium basalts have compositions that indicate melting and/or interaction with subduction-modified lithospheric mantle was involved in their formation. The high-titanium basalts were derived from a relatively uniform plume-type Pacific mantle source. 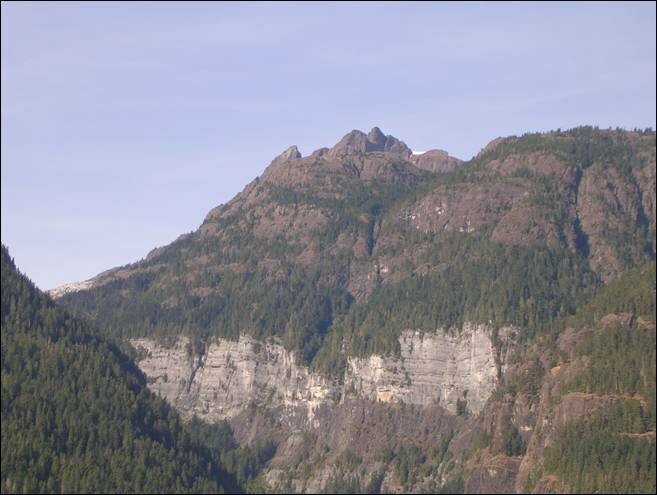 On Vancouver Island, the volcanic stratigraphy was constructed dominantly of tholeiitic basalt with a restricted major- and trace-element, and isotopic, composition. Minor volumes of picritic pillow basalts erupted late in the submarine phase. Volcanological differences in the stratigraphy are primarily related to the eruption environment (deep-water/shallow-water/subaerial). A systematic, stratigraphically controlled evolution of lava compositions is not evident on Vancouver Island. The picritic and tholeiitic lavas were derived from a depleted plume-type mantle source distinct from the source of MORB. Modeling results of Karmutsen picrites indicate melting of anomalously hot mantle (~1500ºC) and extensive degrees of partial melting (23-27%), consistent with a plume initiation model. Steve Israel (Yukon Geological Survey) and Graham Nixon (British Columbia Geological Survey) have been closely involved in this project and we greatly appreciate their contributions. We would like to thank Nick Arndt for helping us get this project started and Nick Massey for insights into Vancouver Island geology. We are grateful to Jeff Trop, Jeanine Schmidt, and Danny Rosenkrans for their advice on geology and logistics within Wrangell-St. Elias National Park and the Alaska Range, and to Bruno Kieffer and Frederico Henriques for field assistance. Bruno Kieffer and Jane Barling assisted with some analytical work at PCIGR. We also appreciate advice from David Brew, Don Carlisle, and Travis Hudson. Bob Duncan, Claude Herzberg, Julian Pearce, and John Mahoney provided advice and assistance with various parts of this project. Funding has been provided by the Rocks to Riches Program administered by the BC & Yukon Chamber of Mines in 2004, by the BC Geological Survey and Yukon Geological Survey, and by NSERC Discovery Grants to J. Scoates and D. Weis. A. Greene was supported by a University Graduate Fellowship at the University of British Columbia. Barker, F., Brown, A. S., Budahn, J. R. & Plafker, G. (1989). Back-arc with frontal-arc component origin of Triassic Karmutsen basalt, British Columbia, Canada. Chemical Geology 75, 81-102. Carlisle, D. & Suzuki, T. (1974). Emergent basalt and submergent carbonate-clastic sequences including the Upper Triassic Dilleri and Welleri zones on Vancouver Island. Canadian Journal of Earth Sciences 11, 254-279. Clowes, R. M., Zelt, C. A., Amor, J. R. & Ellis, R. M. (1995). Lithospheric structure in the southern Canadian Cordillera from a network of seismic refraction lines. Canadian Journal of Earth Sciences 32(10), 1485-1513. Condie, K. C. (2001). Mantle Plumes and Their Record in Earth History. Cambridge University Press: Cambridge, 306 p.
Farnetani, C. G. & Samuel, H. (2005). Beyond the thermal plume paradigm. Geophysical Research Letters 32(L07311), doi:10.1029/2005GL022360. Fodor, R. V. (1987). Low- and high-TiO2 flood basalts of southern Brazil: origin from picritic parentage and a common mantle source. Earth and Planetary Science Letters 84, 423-430. Furin, S., Preto, N., Rigo, M., Roghi, G., Gianolla, P., Crowley, J. L. & Bowring, S. A. (2006). High-precision U-Pb zircon age from the Triassic of Italy: Implications for the Triassic time scale and the Carnian origin of calcareous nannoplankton and dinosaurs. Geology 34(12), 1009-1012, doi:10.1130/g22967a.1. Gardner, M. C., Bergman, S. C., Cushing, G. W., MacKevett, E. M., Jr. , Plafker, G., Campbell, R. B., Dodds, C. J., McClelland, W. C. & Mueller, P. A. (1988). Pennsylvanian pluton stitching of Wrangellia and the Alexander terrane, Wrangell Mountains, Alaska. Geology 16, 967-971. Greene, A. R., Scoates, J. S., Nixon, G. T. & Weis, D. (2006). Picritic lavas and basal sills in the Karmutsen flood basalt province, Wrangellia, northern Vancouver Island. In: Grant, B. (ed.) Geological Fieldwork 2005. British Columbia Ministry of Energy, Mines and Petroleum Resources. Paper 2006-1, pp. 39-52. Greene, A. R., Scoates, J. S. & Weis, D. (2008a). Wrangellia flood basalts in Alaska: A record of plume-lithosphere interaction in a Late Triassic accreted oceanic plateau. Geochemistry, Geophysics, Geosystems 9(in press), doi:10.1029/2008GC002092. Greene, A. R., Scoates, J. S., Weis, D. & Israel, S. (2008b). Geochemistry of Triassic flood basalts from the Yukon (Canada) segment of the accreted Wrangellia oceanic plateau. Lithos (in press). Greene, A. R., Scoates, J. S., Weis, D., Nixon, G. T. & Kieffer, B. (2008c). Magmatic evolution of the accreted Wrangellia oceanic plateau, Vancouver Island, Canada. Journal of Petrology (in press). Greene, A. R., Scoates, J. S., Weis, D., Katvala, E. C., Israel, S. & Nixon, G. T. (2008d). The age and volcanic stratigraphy of the accreted Wrangellia oceanic plateau in Alaska, Yukon, and British Columbia. Geosphere (in review). Herzberg, C., Asimow, P. D., Arndt, N., Niu, Y., Lesher, C. M., Fitton, J. G., Cheadle, M. J. & Saunders, A. D. (2007). Temperatures in ambient mantle and plumes: Constraints from basalts, picrites, and komatiites. Geochemistry, Geophysics, Geosystems 8(Q02006), doi:10.1029/2006GC001390. Israel, S., Tizzard, A. & Major, J. (2006). Bedrock geology of the Duke River area, parts of NTS 115G/2, 3, 4, 6 and 7, southwestern Yukon. In: Emond, D. S., Bradshaw, G. D., Lewis, L. L. & Weston, L. H. (eds.) Yukon Exploration and Geology 2005. Yukon Geological Survey. pp. 139-154. Jones, D. L., Silberling, N. J. & Hillhouse, J. (1977). Wrangellia-a displaced terrane in northwestern North America. Canadian Journal of Earth Sciences 14(11), 2565-2577. Katvala, E. C. & Henderson, C. M. (2002). Conodont sequence biostratigraphy and paleogeography of the Pennsylvanian-Permian Mount Mark and Fourth Lake Formations, southern Vancouver Island. In: Hills, L. V., Henderson, C. M. & Bamber, E. W. (eds.) Carboniferous and Permian of the World. Canadian Society of Petroleum Geologists Memoir 19. pp. 461-478. Kerr, A. C. (2003). Oceanic Plateaus. In: Rudnick, R. (ed.) The Crust. Elsevier Science: Oxford. Treatise on Geochemistry Vol. 3, Holland, H. D. & Turekian, K. K. (eds. ), pp. 537-565. Lassiter, J. C., DePaolo, D. J. & Mahoney, J. J. (1995). Geochemistry of the Wrangellia flood basalt province: Implications for the role of continental and oceanic lithosphere in flood basalt genesis. Journal of Petrology 36(4), 983-1009. MacDonald, G. A. & Katsura, T. (1964). Chemical composition of Hawaiian lavas. Journal of Petrology 5, 82-133. MacKevett, E. M., Jr. (1978). Geologic map of the McCarthy Quadrangle, Alaska. U. S. Geological Survey. Miscellaneous Investigations Series Map I-1032 scale 1:250,000. Mahoney, J., Storey, M., Duncan, R., Spencer, K. & Pringle, M. (1993). Geochemistry and age of the Ontong Java Plateau. In: Pringle, M., Sager, W. & Sliter, W. (eds.) AGU Monograph on the Mesozoic Pacific: Geology, Tectonics, and Volcanism. AGU: Washington. 77, pp. 233-261. Massey, N. W. D., MacIntyre, D. G., Desjardins, P. J. & Cooney, R. T. (2005a). Digital Geology Map of British Columbia: Tile NM9 Mid Coast, B.C. B.C. Ministry of Energy and Mines Geofile 2005-2. Massey, N. W. D., MacIntyre, D. G., Desjardins, P. J. & Cooney, R. T. (2005b). Digital Geology Map of British Columbia: Tile NM10 Southwest B.C. B.C. Ministry of Energy and Mines Geofile 2005-3. McDonough, W. F. & Sun, S. (1995). The composition of the Earth. Chemical Geology 120, 223-253. Nixon, G. T., Kelman, M. C., Stevenson, D., Stokes, L. A. & Johnston, K. A. (2006). Preliminary geology of the Nimpkish map area (NTS 092L/07), northern Vancouver Island, British Columbia. In: Grant, B. & Newell, J. M. (eds.) Geological Fieldwork 2005. B.C. Ministry of Energy, Mines and Petroleum Resources. Paper 2006-1, pp. 135-152. Nixon, G. T., Laroque, J., Pals, A., Styan, J., Greene, A. R. & Scoates, J. S. (2008). High-Mg lavas in the Karmutsen flood basalts, northern Vancouver Island (NTS 092L): Stratigraphic setting and metallogenic significance. In: Grant, B. (ed.) Geological Fieldwork 2007. B.C. Ministry of Energy, Mines and Petroleum Resources Paper 2008-1. pp. 175-190. Nokleberg, W. J., Jones, D. L. & Silberling, N. J. (1985). 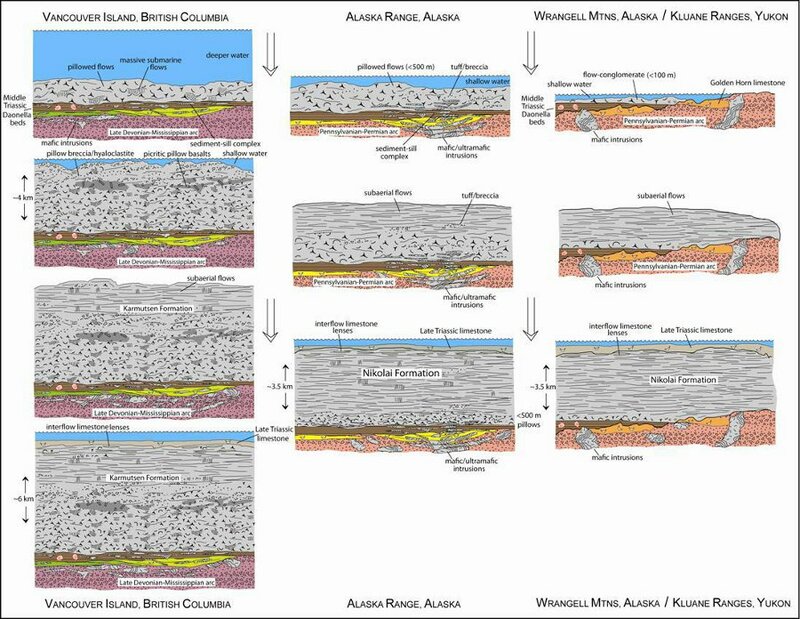 Origin and tectonic evolution of the Maclaren and Wrangellia terranes, eastern Alaska Range, Alaska. Geological Society of America Bulletin 96, 1251-1270. Nokleberg, W. J., Plafker, G. & Wilson, F. H. (1994). Geology of south-central Alaska. In: Plafker, G. & Berg, H. C. (eds.) The Geology of North America. Geological Society of America: Boulder, CO. The Geology of Alaska G-1, pp. 311-366. Parrish, R. R. & McNicoll, V. J. (1992). U-Pb age determinations from the southern Vancouver Island area, British Columbia. Geological Survey of Canada. Radiogenic Age and Isotopic Studies: Report 5 Paper 91-2, 79-86 p.
Peate, D. W. (1997). The Parana-Etendeka Province. In: Coffin, M. F. & Mahoney, J. (eds.) Large Igneous Provinces: Continental, Oceanic, and Planetary Flood Volcanism. American Geophysical Union. Geophysical Monograph 100, pp. 217-245. Plafker, G. & Berg, H. C. (1994). Overview of the geology and tectonic evolution of Alaska. In: G., P. & H.C., B. (eds.) The Geology of North America. Geological Society of America: Boulder, CO. The Geology of Alaska G-1, pp. 989-1021. Plafker, G., Moore, J. C. & Winkler, G. R. (1994). 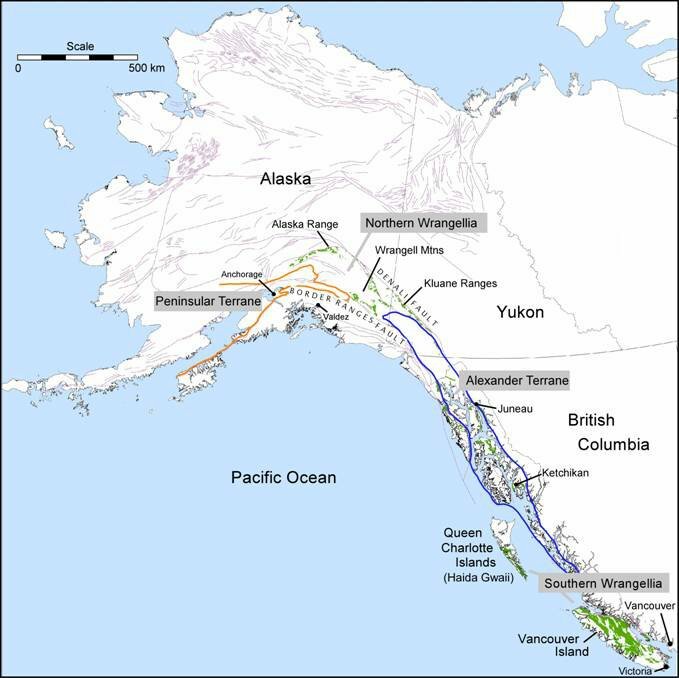 Geology of the southern Alaska margin. In: Plafker, G. & Berg, H. C. (eds.) The Geology of North America. Geological Society of America: Boulder, CO. The Geology of Alaska G-1, pp. 389-449. Plafker, G., Nokleberg, W. J. & Lull, J. S. (1989). Bedrock geology and tectonic evolution of the Wrangellia, Peninsular, and Chugach terranes along the Trans-Alaskan Crustal Transect in the northern Chugach Mountains and southern Copper River basin, Alaska. Journal of Geophysical Research 94, 4,255-4,295. Richards, M. A., Jones, D. L., Duncan, R. A. & DePaolo, D. J. (1991). A mantle plume initiation model for the Wrangellia flood basalt and other oceanic plateaus. Science 254, 263-267. Rioux, M., Hacker, B., Mattinson, J., Kelemen, P., Blusztajn, J. & Gehrels, G. (2007). Magmatic development of an intra-oceanic arc: High-precision U-Pb zircon and whole-rock isotopic analyses from the accreted Talkeetna arc, south-central Alaska. Geological Society of America Bulletin 119(9-10), 1168-1184, doi:10.1130/b25964.1. Salters, V. J. M. & Stracke, A. (2004). Composition of the depleted mantle. Geochemistry, Geophysics, Geosystems 5(Q05B07), doi:10.1029/2003GC000597. Smith, J. G. & MacKevett, E. M., Jr. (1970). The Skolai Group in the McCarthy B-4, C-4, C-5 Quadrangles, Wrangell Mountains, Alaska. U. S. Geological Survey. Bulletin 1274-Q, Q1-Q26 p.
Storey, M., Mahoney, J. J. & Saunders, A. D. (1997). Cretaceous basalts in Madagascar and the transition between plume and continental lithospheric mantle sources. In: Mahoney, J. J. & Coffin, M. F. (eds.) Large Igneous Provinces: Continental, Oceanic, and Planetary Flood Volcanism. AGU: Washington. Geophysical Monograph 100, pp. 95-122. Tejada, M. L. G., Mahoney, J. J., Duncan, R. A. & Hawkins, M. P. (1996). Age and geochemistry of basement and alkalic rocks of Malaita and Santa Isabel, Solomon Islands, Southern Margin of Ontong Java Plateau. Journal of Petrology 37(2), 361-394. Vervoort, J. D. & Blichert-Toft, J. (1999). Evolution of the depleted mantle: Hf isotope evidence from juvenile rocks through time. Geochimica et Cosmochimica Acta 63, 533-556. Weis, D., Kieffer, B., Hanano, D., Silva, I. N., Barling, J., Pretorius, W., Maerschalk, C. & Mattielli, N. (2007). Hf isotope compositions of U.S. Geological Survey reference materials. Geochemistry, Geophysics, Geosystems 8(Q06006), doi:10.1029/2006GC001473. Weis, D., Kieffer, B., Maerschalk, C., Barling, J., de Jong, J., Williams, G. A., Hanano, D., Mattielli, N., Scoates, J. S., Goolaerts, A., Friedman, R. A. & Mahoney, J. B. (2006). High-precision isotopic characterization of USGS reference materials by TIMS and MC-ICP-MS. Geochemistry, Geophysics, Geosystems 7(Q08006), doi:10.1029/2006GC001283. Wilson, F. H., Dover, J. D., Bradley, D. C., Weber, F. R., Bundtzen, T. K. & Haeussler, P. J. (1998). Geologic map of Central (Interior) Alaska. U. S. Geological Survey Open-File Report 98-133-A, http://pubs.usgs.gov/of/1998/of98-133-a/. Wilson, F. H., Labay, K. A., Shew, N. B., Preller, C. C., Mohadjer, S. & Richter, D. H. (2005). Digital Data for the Geology of Wrangell-Saint Elias National Park and Preserve, Alaska U. S. Geological Survey Open-File Report 2005-1342, http://pubs.usgs.gov/of/2005/1342/. Yole, R. W. & Irving, E. (1980). Displacement of Vancouver Island, paleomagnetic evidence from the Karmutsen Formation. Canadian Journal of Earth Sciences 17, 1210-1228.